It’s going to be a superb Nub’s Nob ski day with comfortable temperature, light wind, excellent grooming and a great snow surface. The Pintail Peak warming hut is open today with home-made soup, baked goods and our new espresso bar. NASTAR racing today from 12:30 to 2 p.m.
It’s a perfect day to be on skis at Nub’s Nob. XC Trail System: Trails are 100% open and in excellent condition. All trails were power-tilled and tracked Saturday morning. There is a light dusting of snow on the trails which will make for excellent classic skiing today. Lifts: 7 Lifts and the Rope Tow. Runs: All 53 Runs- Scarface will close at 11:30 and is open to teams training for the DII regional meet tomorrow. Below are the latest postings from the Nub’s Nob Ski Area Page On Facebook. 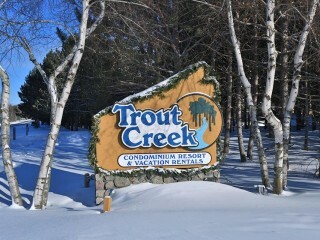 Trout Creek Condominiums - Up North made easy&period; Trout Creek Condominiums - Up North made easy. shared a post. Trout Creek Condominiums - Up North made easy&period; Trout Creek Condominiums - Up North made easy. updated their cover photo.